Coach Mark Lane believes England need more big hitters following their exit from the World Cup. 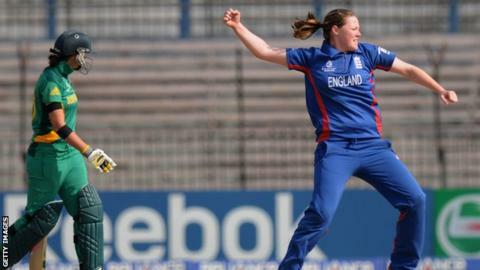 The defending champions saw opening bowlers Katherine Brunt and Anya Shrubsole impress in India. But they failed to match the powerful batting of some of their rivals, managing just three sixes in the tournament so far. "We are looking for players that can hit the ball a long way," Lane told BBC Sport. "We have players who can hit sixes but we need more, especially when we play on good surfaces." Brunt and Shrubsole combined to take 25 wickets between them, with Lane acknowledging the work both have done with Warkwickshire bowling coach Graeme Welch. "As much that Brunt and Shrubsole bowled quickly, they bowled with skill, which has been the key," added Lane, who presided over England's 2009 World Cup and World Twenty20 successes. "We are trying to stay ahead of the game, we do a lot of preparation against boys, putting our girls out of their comfort zone." While Shrubsole and Brunt are two of the three top wicket-takers in the tournament, not one of England's batters have managed more than 200 runs. Among them, Sarah Taylor, tipped for a switch to men's cricket before the competition, registered three successive ducks. However, Lane does not believe the added publicity contributed to the wicketkeeper's disappointing showing. "I felt that was all dealt with and left back in England," said 45-year-old Lane. "We've spoken about the situation and Sarah felt very comfortable that it had been left behind. "There's expectation on all of our players, we play a lot of games on television, we are getting judged and people will form opinions. With rewards come responsibility. "Sarah is a key player, but we don't rely on one player. There's not been enough contributions from the batters." "England would have prided themselves on their fielding but some of the catches that have gone down in the games they have lost have been crucial. The batting, with Sarah Taylor making three ducks on the trot, has not been as good as expected. Apart from Charlotte Edwards' century against India, nobody has come in and made a really big score." Captain Charlotte Edwards, in her fifth World Cup, was the only England player to score a hundred, becoming the highest run-scorer in women's one-day international cricket in her 109 against India. At 33, the Kent batter has admitted that the 2017 World Cup seems "a long time away", but Lane has backed the skipper to continue, with this summer's Ashes and the 2014 World Twenty20 on the horizon. "She's as fit as she's ever been and is playing as well as she's ever been," said Lane. "She is a very inspirational leader, very honest with the group and very true to her herself. "She has years of cricket nous and experience behind her. People keep talking to me about Charlotte retiring, but that's not on the radar. "Lottie will know when the time is right but, before then, she's got my full support. I don't see her retiring imminently." England meet New Zealand in the third-place play-off in Mumbai on Friday. You can hear the full interview with Mark Lane during Test Match Special's coverage of England's third-place play-off against New Zealand on Friday, on 5 live sports extra, mobiles and online.